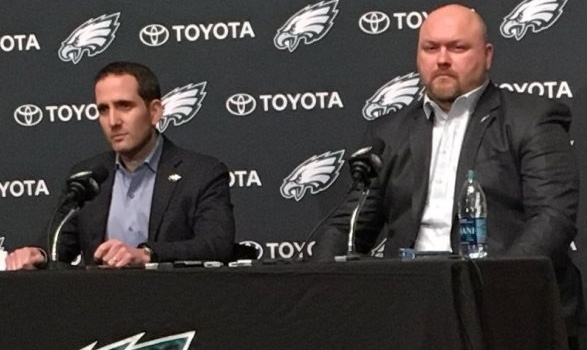 Howie Roseman knew he wanted Brandon Graham back in 2010. He moved up in the draft and got him. Roseman knew he wanted Fletcher Cox in 2012. Again, he moved up and got him. Roseman pulled off a minor miracle when he got the Eagles all the way up to number two and drafted Carson Wentz. This is going to be a very different draft. The Eagles had to go and win the stinkin’ Super Bowl and now they are stuck way down at 32. Thanks for nothing, guys. Way to make the draft difficult. Even worse, the team has no 2nd or 3rd round pick. Those are crucial rounds this year, with a less than great Top 20 or so players. Roseman is still working to trade Mychal Kendricks and there have been reports that he would move Ronald Darby. They could do this to move up in the draft or to acquire additional picks. The team could also move down from 32 to add an extra pick or two. No matter what happens, this is going to be a scout’s draft. Joe Douglas and his staff have need to do a great job this year. This all started last spring, when they started with a master list of prospects to check out. From the spring through winter, the scouts traveled the country, evaluating players and gathering information. Who was fast? Who was coachable? Which TEs could throw passes? Which QBs could catch them? The Senior Bowl, other all star games and Combine gave the scouts a chance to see the players as NFL prospects, outside of their college environment. Pro Days involve scouts and coaches. Scouts go to all of the key Pro Days and most of the small ones as well, gathering workout data and looking for any other last minute nuggets that could be of value. Coaches go to work out specific prospects. This can mean the team is very interested in that player. It can also mean there are questions and the coach wants to see what he thinks of the player by working him out. It isn’t that tough to figure out the top prospects in the draft, but finding players on Day 3, especially at the bottom of rounds, can be a real challenge. Scouts need to do a great job of finding players that fit the scheme and that the coaches will like. That is one heck of a college scouting staff. The Eagles have done a solid job in recent years with late picks. Jalen Mills was a 7th rounder and started all last year. Halapoulivaati Vaitai was a 5th rounder and started at LT most of last year, after starting at RT for most of 2016. Corey Clement was a UDFA who played like a star in the Super Bowl. The jury is still out on guys like Elijah Qualls, Shelton Gibson, Destiny Vaeao, Billy Brown and Greg Ward. They could become good role players or lose their jobs to the next wave of late rounders and UDFAs to join the roster. I look forward to seeing what the scouts do. Picking 32nd is a good problem to have.